Launching , from one of the most reputed business houses of India, we bring for you - Idea Money Wallet, one of the most secured payment wallets in India! 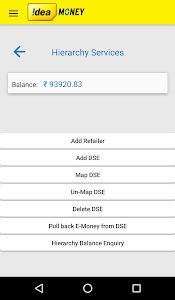 Use this app extensively for making online mobile & data card recharge, DTH recharge, pay your postpaid & utility bills, transfer money to another wallet or bank account instantly as well as to shop online. •	Safe & Secure Experience : Non compromising on any customer data is our first objective. 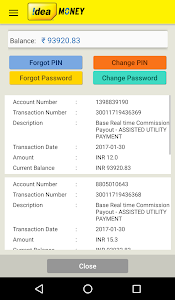 •	Simple, Fast & Easy to use : The interface has been especially designed keeping Indian users functionalities in mind. To help you simplify & multiply your financial needs is our guiding objective. •	Multiple Unique Offers : Amazing offers on online merchants across segment i.e. entertainment, food etc. What all functions can be fulfilled with Idea Money? 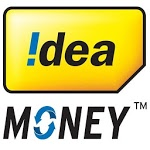 Idea Money is an RBI authorized payment wallet service. 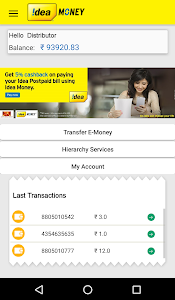 To use Idea Money Wallet, download the app and load money into your wallet using net banking, credit or debit card. Similar to "Idea Money Distributor"